Kevin joined the Body Logic team in 2017 after spending the last two years living and working on the Gold Coast. 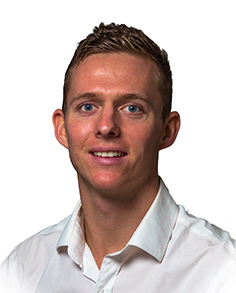 He completed his degree through Curtin University, graduating with distinction and first class honours for his research, which has been published in two physiotherapy/sports science journals. Kevin is currently completing his PhD with Body Logic director Professor Peter O’Sullivan and others at Curtin University. Here he is investigating the relationship between low back pain and movement using innovative motion sensors. His primary focus is providing the highest level of care for patients, and to integrate contemporary research into clinical practice. Using a patient specific and holistic approach, he has helped a variety of people reach and exceed their goals, from weekend warriors to Olympic level athletes, and those with persistent pain problems. Kevin also has a love for sport related pain problems covering national and international touch-rugby competitions in late 2015, and stepping in as the team physiotherapist for the East Perth WAFL side in February 2017. He also has extensive experience working with state basketball and WAAFL teams, and has provided physiotherapy services for national U14 and U20 basketball competitions. Outside of physiotherapy Kevin enjoys the outdoors, sports, surfing, camping, travelling, photography/videography, and droning.